Got a call from Honda Corp (Chino, CA). Lady stated Honda working on a fix. No solution that dealerships can perform at this time. It's a waiting game. Hopefully by this next year, the issue will be fixed. Hey everyone. Been following this thread as we bought an Elite about 3 weeks ago. Same symptoms shortly after using the center console USB to stream media. Shortly after the first week on a road trip we started hearing a crackle/pop sound from the speakers and the RES go blank (still has audio). Cabin watch failed as well, and the RES app said connecting. Took it in last Monday to see if they knew anything about a fix, which the service advisor didn't. I was thinking it had to be a software bug. Anyways they kept it for the whole day and their technician had to basically source another Elite on the lot and use a process of elimination. 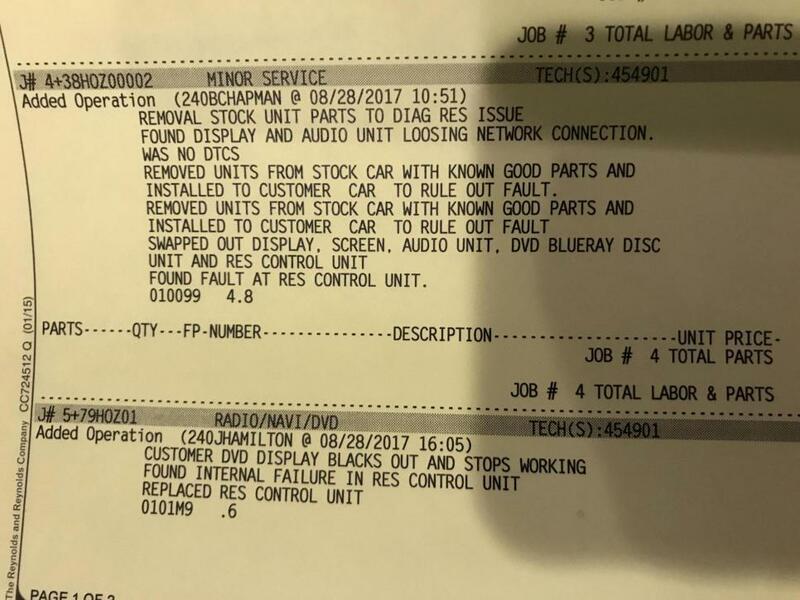 Here are the notes from the repair invoice which says he eventually swapped the RES control unit that allowed the screen to display and image for over an hour. We've had it back for about a week without an issues. The service center was Round Rock Honda. Hope this info helps. Thanks for the update. Anyone else have their dealer replace the RES control unit? I have an Elite, June 2017 production, that has a RES with a mind of it own. HDMI input from an iPhone or iPad works great until it doesn't. Sometimes it works from a iPhone but not the iPad, or the reverse. Sometimes I only get audio. It usually works again after the car has been shut off. The HDMI freezes a lot. The BD player freezes also, even with new, unscratched discs. The ATT Hotspot drops out from time to time only to be restarted on engine shut down. The auto door lock works great except when it doesn't too. We purchased the 2018 Elite for the car tech and safety features. We had 7 great years with a Sienna. Honda needs to get this worked out or there is likely a 2019 Sienna in my future. While I share your frustrations, trust me it's the same for me with the RES working then not working, these are the unfortunate realities with first year models, especially one that's so loaded down with new tech. Going to a 2019 Sienna may not be the answer given that it'll be a first year redesign model as well for Toyota. You may just be trading in one headache for another. I hope that most of these electronic issues can be resolved with software/firmware updates. It's up to us first line owners to push the fixes with Honda. That's the burden with being first. The alternative is to buy an older model or wait a few years. The sad reality is that we are all in a way guinea pigs and they are testing in Production. Within time I'm sure you'll see the number of TSBs and recalls increase to address most of these glaring issues. The van has only been out since July. It's still relatively new. Give it time and patience. That's the nature of the game. I give Honda until next summer. I went on 3 road trips this summer without the RES working. I hope Honda get the act together and find a fix by next summer. I wonder how much I can resell my Elite for. It has been 4 weeks since I left my minivan at Honda dealer, just got a call from Honda Corp( Chino,CA), she said now they will have to send a field technician to dealer to check what wrong with RES and hope will find out what solution to fix it since all the tech at Honda dealer unable to fix it. I just want to take this time to thank everyone who's purchased a 2018 for being guinea pigs for the plebians. Same issues on my Elite. Cabin Watch died after about two hours on the road. Popping noise from speakers. Could not kill the noise. Radio screen sometimes said "check tuner". Took it to dealer next day. Of course, everything worked fine then. Dealer said to bring it back when it doesn't work. I think it is a heat related issue with the hardware and not software. Yes we are guinea pigs, but for $50K it should work! Maybe a class action suit? Thanks for this info . Hope that they could fix right. For what I did when it happens grab the fone record it right away. My first attempt to dealer for nothing because it work fine for them , didn't see problem. BTW we have to go on their Facebook page write down our issues with this car on their advertising video about the Odyssey , the more of us hopefully they listen at least. I posted 5 times of different their advertising. Also see Larry Fung posted. Dealer called to inform me last week my replacement computer is in and will be installed this coming week. I will update this forum with the results. Hopefully this solves all the issues. My system has a mind of its own I tell ya. I have so many pictures and video of this thing doing the weirdest stuff it laughable now. One thing I noticed is if I leave a disk DVD CD blueray in the RES drive, remotely start the vehicle and get in and drive the whole system goes wacky. Flashing screens on both RES and driver displays. Can't change anything. Multiple error messages. Even volume and power controls act oddly. Cant even shut it off when powering off car and getting out. Still stays on until I get the "network communications lost" message comes up and then the system shuts down. I also have the squeaky second row back seat behind passenger. It's like driving with a bunch of chipmunks back there. If someone sits there squeak is gone. This will be my third visit to dealer to fix the computer and this maddening seat squeak. Over 8000 kms now. I will say it this point other than these two issues the vehicle has been great. I traded a 2013 on this and the improvements are huge to say the least. Same thing here. I have an appointment with dealer 9-14-17 for chipmunks noise in the back , I think second row rear passenger side. When my kid seat on noise go away. One time I have to pickup something 2 hours drive with my friend . He kept laughed . He doesn't want music on just joined the noise. I'm so pissed. I started hate this car. I've tried to mirror my iphone and used DVD's for more than 3 hours at a stretch and for both times the RES has worked flawlessly.